Crashplan is an good example of what happens when the right design elements come together in just the right proportion to fill a sudden, emerging need. In this case that need is secure data backup, either on or off site. In an age when data has become a currency in it’s own right, or when cell phones dropped in pools can cost you your copy of every captured moment of a summer vacation, having a safe place to stash that data is a need that has given rise to an industry and in 2007 the folks at Code42 threw their hats into this arena with CrashPlan. I like these people and their signature product for a lot of reasons, but let’s start with the company name, Code42. It was inspired by The Hitchhikers Guide to the Galaxy, which personally I thought made an amazing novel but a little less than stellar movie. In the story, 42 is the answer to the meaning of life, the universe, and well, everything. The CrashPlan approach to answering the most pressing questions facing any data back up storage solution has been progressive, intuitive and innovative, and places them on a secure footing in the digital security marketplace likely, for years to come. Let’s take a look at them and what they offer in a little more detail, how they differ, and how this has positioned them so well in the market. Unlimited data storage. Flexible payment options. Automatic back up. Works for most operating systems. Initial data block upload can be slow. Can’t back up mapped drives in Windows. 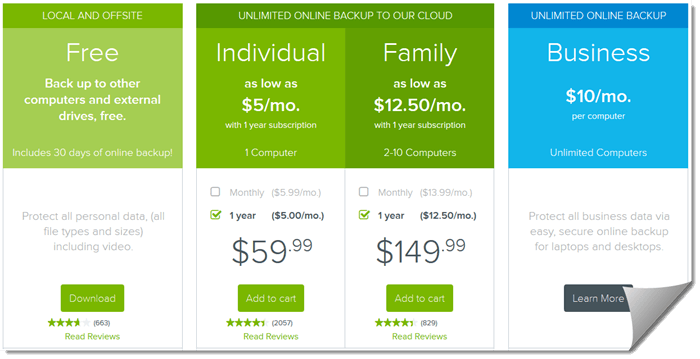 CrashPlan offers unlimited, automatic data storage either off site to their servers for a fee or locally to on site systems for no charge. Rather than charge for the amount of data you store they charge for the number of devices you are storing from by providing flexible rate plans. This is an innovative approach which allows you to forget about caps and data limits and provides a degree of flexibility that other services tend to lack. While they do offer a free trial it is a 30 day limit to the cloud and the only really free service is the local on site back up, but that’s better than nothing and does come with their software which is simple and easy to use. When you look at the details of what they offer and how they support it you see the value proposition is quite significant. CrashPlan Free: This plan is completely free and available to any user who wants to try their computer backup solution. The plan also generously includes access to 30 days of online backup at no charge. You’ll have access to the standard 128-bit security, online documentation and user forums for assistance. 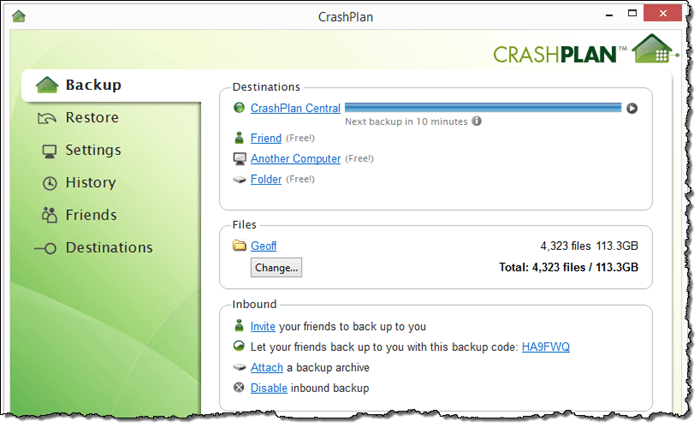 CrashPlan Individual: This plan covers access to backup and protect one computer. This plan is priced at $5.99/mo or $59.99 for one year prepaid. This premium plan and all other premium plans include access to unlimited online storage for your data, continuous minute by minute incremental backups, 448-bit encryption, access to email/phone support and desktop file access via their mobile apps. CrashPlan Family: Includes access to protect 2-10 computers on a single plan and meant for families that want a comprehensive backup solution. This plan is priced at $13.99/mo or $149.99 annual prepaid. This plan is comparatively the same as the individual plan above with exception to the amount of computers you can backup. CrashPlan Business: The business plan is highly flexible and scales quickly with any expanding business model. There are two tiers of business plans available, one for businesses with up to 200 computers and another for more than 200. The “CrashPlanPro” business plan charges $9.99/mo per user and provides access to online management of users including a real time dashboard, individual login accounts and reporting features. Overall their plan design is simple and intuitive, a theme I find resonant with many aspects of both product and company throughout. You can drive the price down to $5.00 for an individual by paying $59.99 for a year,$ 144.99 for two years, or $189.99 for four, which works out to a little less than four bucks a month. For the family plan it starts at $149.99 for a year, $289.99 for two, or $429.99 for four which is a little less than nine bucks a month, again a pretty good deal in our estimation in context to the services and support provided. For secure transmission of all your important files and to keep them safe in transit, CrashPlan uses a 448 bit blowfish data encryption, which is a very strong level of security used across the industry. While this does not make them stand out from the pack, it does show the level of commitment and quality these folks are bringing to their product and services as they did not skimp on this most critical aspect of their business. 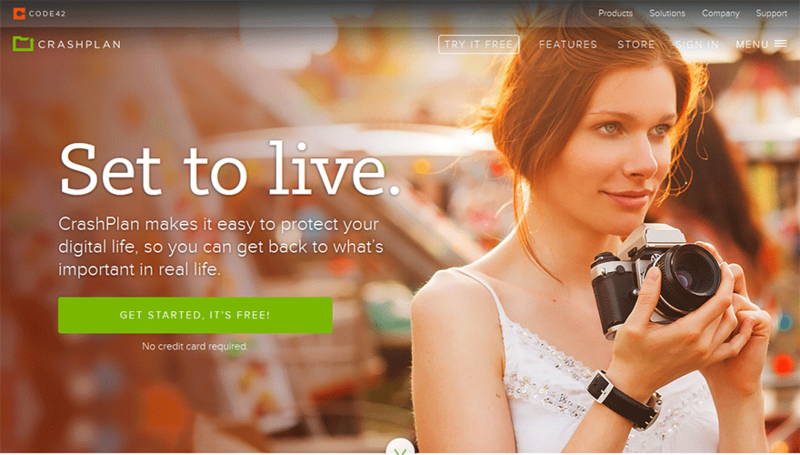 This adds peace of mind to the ever growing value proposition they are bringing to the table. Getting CrashPlan set up on any Windows (XP to 8.1), Mac (10.5 to 10.10), and Linux system was designed to be straight forward, simple and intuitive, which is another progressive and thoughtful design element. While they only offer direct technical installation at the business level, they more than make up for it with their software. It’s a basic tab format presentation with clear markers pointing to the various customizable elements of the platform making the things you need very easy to find. You have the ability to choose from either the local or online storage of specific files or file sets to either your own servers or theirs, which is unlike most other service providers in the industry. As I said before, it’s all about the details. Once you set your parameters you just let it go, it really is that simple. I found the customer care department to be both knowledgeable and willing to help me with a variety of problems I posed to them. I find support and customer interactions to be the most critical aspect of any service no matter how slick or smart it may be. As such, I pay close attention to the level of service and back end support than goes into producing any quality product, and I am happy to say that CrashPlan exceeded all my expectations yet again. I hit their representatives, whom they call customer champions, with a few scenarios and I found they gave the right kind of answers. Couple this with their help database and FAQ’s I came away feeling that they level of support was commensurate with the quality of the product they are putting forth, an over all positive result in my estimation. One nice feature of their service is the online documentation including access to free video training which will walk you through their software installation, app installation, data management, settings, data recovery and more. Of course, if you want to learn quickly by reading, they have a huge collection of resources available organized by category, popularity, ratings, tags and more. The entire archive of documents is searchable to help you find the help you need as fast possible. On balance, CrashPlan really seems to be doing everything right. From unlimited data storage to high security encryption, to flexible, relatively affordable payment plans it seems they are ahead of the curve in many ways. It is easy to see a very bright future for this company in the industry and is an even easier choice to make when looking at service providers. They quickly became my favorite in the field of choices and my experience in testing their product has been positive and enlightening. Though it is said that when you first order the service they back up all your existing files in a single block that can be slow depending on individual circumstances, service after that is found to generally quick and efficient as well as reliable. I would recommend them highly to anyone who needs or is even curious about backing up their critical data, and I wouldn’t be to surprised to see other companies follow their lead into the future.